Conflicting Data: How Fast Is the World Losing its Forests? The world is losing trees faster than ever. An area the size of Italy disappeared last year. Or did it? New research suggests three-quarters of those lost forests may already be regrowing. That hardly means we are out of the woods. Fighting climate change and protecting biodiversity still needs a global campaign to reforest the planet. But it does suggest that, given the chance, nature will do much of the work. Researchers say we urgently need a way out of the statistical quagmire. And this year the first tentative steps at resolving the data crisis have been taken. While both databases focus on the extent of tree cover, neither addresses changes in biodiversity or the carbon uptake of forests. There are two main data sources for tree loss, and they are increasingly contradictory. One, the Global Forest Watch (GFW), is compiled from satellite images by the World Resources Institute, a Washington think tank. It paints a gloomy picture, putting the decline in tree cover last year at 72.6 million acres, almost 50 percent more than in 2015. That analysis is supported by on-the-ground observations, especially in Southeast Asia, where forest continues to be converted to oil palm. The other main source for deforestation data, the Global Forest Resources Assessment (FRA), which is compiled from government inventories by the Rome-based UN Food and Agriculture Organization, is less bleak. It estimates the annual net loss, once forest regrowth is taken into account, at barely a tenth as much: just 8.2 million acres. And it says deforestation rates have declined by more than 50 percent in the past decade. The drastic difference extends to data from individual countries. In the United States, China, Australia, Canada, Russia and several other countries, the FRA shows forests gains while the GFW shows big losses, says Holmgren. The two datasets were more or less in agreement 20 years ago, but have been diverging ever since. So how have such huge differences arisen? And which, if either, is right? On the face of it, the satellite-based GFW is more rigorous. It asks a simple question of the Landsat images it analyzes: What area of tree cover has disappeared since last year? It does not ask how or why, just how much. The FRA data, on the other hand, is largely a measure of registered land use rather than actual tree cover. For instance, its definition of a forest includes areas that may be treeless as a result of logging, but where governments still classify the land as productive forest that is expected to regrow and be logged again. Both the FRA and GFW databases come in for heavy criticism. Most obviously, the FRA relies on governments owning up to forest loss. But while the GFW does not suffer from political interference, critics such as Holmgren say it has a potentially even bigger blind spot. It cannot see forest regrowth. The problem is that while deforestation is sudden, complete, and easy to spot when comparing satellite images from one year to the next, forest regrowth is slow, incremental, and much harder to identify from year to year. Moreover, because the GFW does not assess what happens to the land after the forest is lost – whether it is cultivated or simply left alone – it can give no indication of whether the loss is likely to be permanent, or whether the forests could indeed regrow. And while both databases address the extent of tree cover, neither claims to address key changes in either biodiversity or the carbon uptake of those forests. The authors of the two analyses recognize the limitations. The two datasets are “complementary rather than contradictory,” says the World Resource Institute’s Nancy Harris. But the problem is that they give out very different and irreconcilable messages about the state of the world’s forests. One is highly pessimistic; the other guardedly optimistic. So how are we to decide what progress, if any, is being made to end the loss of the world’s forests, and whether promises by governments and corporations to end deforestation are on target? Forest researchers are belatedly coming to grips with the problem. Two studies published in recent weeks stand out. 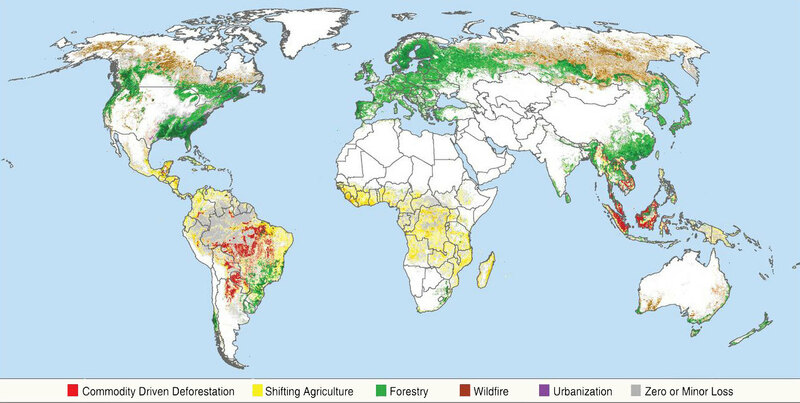 In North America and Russia, forest loss is overwhelmingly temporary, mostly from wildfires but also from logging. Philip Curtis of the University of Arkansas and colleagues, writing in Science in September, used high-resolution Google Earth imagery to devise a model that could predict the causes of tree loss in the GFW’s global satellite images. The aim was to distinguish between places where the trees are replaced by some other land use and those where the forest loss is likely to be temporary, since the land remains available for nature to recover. 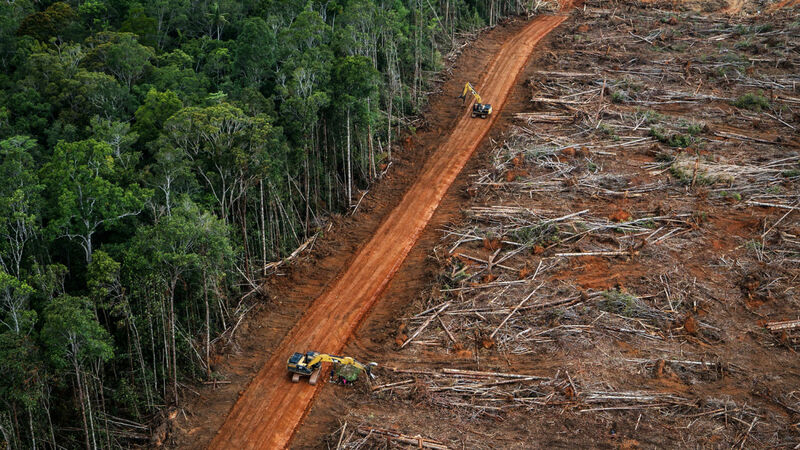 He and his colleagues found that only 27 percent of forest loss between 2001 and 2015 met their definition of permanent, with the land taken mainly for commercial “commodity” agriculture such as growing palm oil, but also for mining, oil and gas production, and urban expansion. That loss, of around 12.4 million acres of trees a year, had barely changed over the period, they reported, with a sharp decline in forest cover in the Brazilian Amazon matched by rises elsewhere. Of the remaining tree loss, they found that wildfires were responsible for 23 percent, shifting cultivation (where forest is cleared and cultivated for a few years, before the farmers move on and the forest hopefully regrows) was responsible for 24 percent, and forestry for 26 percent — in each case suggesting only temporary loss. This is the first time forest loss has been broken down in this way, says Harris, who was a coauthor on the study. It creates a new geography of deforestation. In North America and Russia, the loss is overwhelmingly temporary, mostly from wildfires but also from logging, according to the study. In the tropics, however, the picture is more mixed. Temporary losses from shifting cultivation make up 93 percent of forest cover loss in Africa, the study found, while permanent deforestation from agricultural expansion is responsible for 61 percent of the loss in Southeast Asia and 64 percent in Latin America. Curtis and his coauthors acknowledge shortcomings in their data. The model “performed more poorly in Africa,” says Christy Slay, the study’s director of technical alignment. “Confusion occurred between large-scale conversion [to commercial agriculture] and shifting cultivation,” she told Yale Environment 360. But for logged land to fall into the category of temporary deforestation, it had to show “evidence of forest regrowth in subsequent years.” Most met that test. “All forms of forestry were characterized by a dominant forest regrowth signal in the years following loss,” Curtis says. Nonetheless, the analysis fails to distinguish between different types of tree cover. So when logged natural forests are replaced by commercial plantations, the change is simply recorded as regrowth, even though most of the former biodiversity may be lost. Another detailed study, published in August, looked at woodlands across seven countries of southern Africa. Iain McNicol, of the University of Edinburgh, used novel radar imagery to estimate both forest cover and how much wood the forests contain. He found that both forest loss and regrowth were much more widespread than previously supposed. The balance between loss and gain varied from place to place. Losses were greatest near cities and roads, where demand for firewood and charcoal was high, while gains were greatest in more remote areas. But overall, the amount of wood biomass — and hence the carbon it contains — was stable in the woodlands, which cover about half of the region. What came through, McNicol told e360, was the “highly dynamic” nature of the change going on and the “large regrowth potential” of temporarily deforested areas. The findings confirm other recent studies in Africa that have found strong forest regrowth in woodlands outside the rainforest belt of central Africa, often after farmers abandon their land and head for the cities. “Africa’s woodlands and savannahs are reforesting,” says Ed Mitchard of the University of Edinburgh, a coauthor on the McNicol paper. His own field research in central Cameroon found “the forest is coming back really fast… If deforestation and degradation could be reduced, Africa could quickly become a significant carbon sink,” he said. One researcher estimates 12.4 million acres of forests are permanently converted to growing commodity crops such as palm oil each year. Contradicting Curtis, they suggested that logging cannot be seen as merely temporary deforestation, because recovery will always be incomplete. “Logging is the most pervasive threat facing species inhabiting intact forests,” they concluded. That debate remains unresolved. But regardless, a new picture of deforestation is emerging that is very different from the conventional image of forest loss as a one-way street. The situation is much more fluid, it seems, with rapid forest loss sometimes counterbalanced by equally rapid recovery, at least in forest cover. “Over the last decade, we have realized just how fast all these forests, woodlands, and savannas are changing, and how poorly we are able to quantify this change,” says Mitchard. Curtis says the idea, implicit in data from the GFW, that “any tree cover loss shown on the map represents deforestation” is a “misperception” that needs to be dispelled. McNicol says this new picture suggests that existing international policy for reducing carbon emissions from forests, which concentrates on protecting intact forests, may not always be the best course. In many areas, ensuring that degraded or temporarily deforested areas can regrow may be more effective. None of this means that the deforestation crisis is close to being resolved. Curtis estimates that some 12.4 million acres of forests are permanently converted to growing commodity crops such as palm oil each year. And, despite numerous corporate and government promises to the contrary, there is no sign of that figure declining. The new findings underline the urgency of the need to halt the advance into the world’s forested areas of permanent agriculture to supply commodity markets. But they offer hope, too. If we could stop the onslaught of agriculture into tropical woodlands, we could see not just an end to deforestation but a massive and rapid natural resurgence of tree cover — and a huge surge in the carbon that those forests contain. Halting climate change requires nothing less.